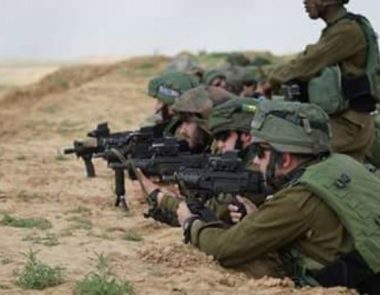 Palestinian medical sources have reported that an Israeli army sharpshooter shot and seriously injured, Tuesday, a young man with a live round in his neck, after the army attacked protesters near the border fence, east of Khan Younis, in the southern part of the Gaza Strip. The Palestinian was rushed to Nasser Hospital, in Khan Younis, where he was instantly admitted to surgery, and is currently in a serious condition at the Intensive Care Unit. Eyewitnesses said the soldier who shot the Palestinian was stationed, along with other army sharpshooters, behind the huge sand hills the army created along the border fence. The protests, which started on the Palestinian Land Day on March 30th, are still ongoing despite the Israeli army’s excessive use of force, and the “Shoot To Kill” orders from both the military and political leadership in Tel Aviv. The soldiers have killed 30 Palestinians in the ongoing protests in the Gaza Strip, and injured more than 3000 others, including dozens who suffered serious wounds.